Snatchers are a type of Salmonid that appears in Salmon Run in Splatoon 2. If a Golden Egg stays on the ground for long, a Snatcher spawns; it will then pick up to three nearby Golden Eggs and try to escape with them. Inklings can splat these egg bandits to get them to drop the eggs, but new ones will reappear unless the Egg is claimed by an Inkling. Before they take the eggs, they let off a distinct giggle that serves as an audio warning. A single Snatcher is assigned to each "drop" of Golden Eggs (normally, the three eggs that are dropped from one Boss Salmonid), and will not take eggs from other "drops"*. If a Snatcher is splatted, another will be spawned after a while and will target the same Golden Eggs, until either the wave ends or all remaining Golden Eggs have been collected by Inklings or by the Snatcher. If all three Eggs have been collected, the Snatcher will turn back and return into the ocean without collecting any Golden Eggs. During Mothership waves, a "drop" consists of the single egg dropped when splatting a Chinook. During Goldie Seeking waves, a "drop" is a single egg that falls off the Goldie. In these two Known Occurrences, Snatchers will only ever carry a single Golden Egg. 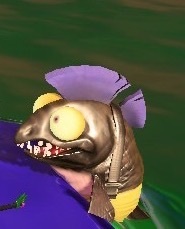 Snatchers are the only type of salmonid that are passive since they come in the stage empty handed only to take Golden Eggs, which is distracting for players. Snatchers are almost identical in appearence to Chums. The only difference is that Snatchers have a purple mohawk instead of a red one, making them easier to pick off. Tasked with procuring Golden Eggs, Snatchers will emerge from the sea when Golden Eggs are present, and try to seize them and return them to the depths. Any snatched Golden Eggs can be retrieved by defeating this Salmonid before it returns to the water. Not known to attack directly. Can be neutralised relatively easy with a direct hit of ink. New recruits usually start as Snatchers to give them a taste of the battlefield. Provided they demonstrate sufficient aptitude at collecting Golden Eggs, they will be allowed to join the front lines. A Snatcher holding two Golden Eggs. A view of a Snatcher head-on. A Snatcher in the middle of jumping into the water, showing the full length of its' body. Multiple Snatchers going after individual eggs during The Mothership event. This page has been accessed 17,140 times.